“The mystery of moral authority is that we persist in attributing objective and inescapable authority to moral judgments even though there are so many reasons not to do so. The Mystery of Moral Authority is an accessible, up-to-date, thorough, convincing, and fair-minded attempt to show that the ‘mystery of moral authority’ has not been, and most likely will not be, solved. To solve it one would need to explain the source of the allegedly inescapable objective authority that is commonly thought to characterize moral judgments. Here! More news to come over the next couple of months as the release date rolls around. I have a new article at TPM Online: "Freedom for The Speech We Oppose". Check it out! My new book, The Mystery of Moral Authority, is scheduled to appear from Palgrave Pivot toward the end of 2015. It's already available for pre-order from Amazon, if you happen to be interested. Please consider! Or perhaps let your local academic library know. I've now been consulted about the cover design and the back-cover copy (the latter is mainly a generous and detailed endorsement from Richard Garner, author of Beyond Morality). I expect to see some page proofs soon, so we're at the real business end of the production pipeline. 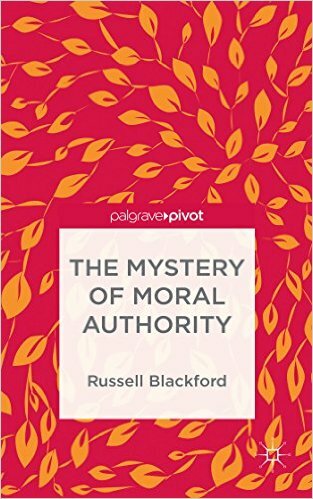 I'm sure that The Mystery of Moral Authority will be a handsome little monograph. I also think it has an important message, though I suppose I would think that. I'll provide more news as the book approaches its publication date. This is cross-posted on the Talking Philosophy site. I have a post over at Cogito about the debacle with extreme anti-abortion campaigner Troy Newman, who has been excluded from visiting Australia. This is a quick postscript. At the time I wrote the post, Newman had managed to get here despite not having a valid visa, but he has since failed in an attempt to stay in Australia by way of an urgent hearing in the High Court. I wasn't expecting the court to be sympathetic to him once he took the law into his own hands and managed to circumvent the system to fly here. But up to that point, he had evidently complied with all requirements. His original visa was evidently legally obtained, and there was no obvious reason to find any fault with the process up to then. The High Court's decision doesn't yet seem to have been published anywhere online, so it's difficult at this stage to be sure of Justice Nettle's exact reasoning. Going on media reports, however, the main point appears to have been that Newman had not come to the court with "clean hands", in that he had flouted the law in deliberately flying and arriving without a visa. That seems fair enough - I'm not critical of the court for deciding the case on that basis. It also seems that he has been given a further opportunity to appeal (from the US) against the decision to revoke his visa. If he succeeds, he'll be able to come here in the future. But his actions over the last few days may be seen as weakening whatever case he originally had. In my view - which the court also seems to have stated - he did originally have an arguable case to have his visa reinstated. I.e. he had a case, leaving aside his behaviour in coming to Australia unlawfully. But that may now be moot. This situation is troubling for me in the sense that Newman's views are, as far as I'm concerned, anathema. He is exactly the kind of extreme, theocratic moralist that I can't stand and have spent much of my life opposing. But it does not follow that he should be prevented from speaking in Australia merely because he might put extreme political views such as that abortion should be a capital crime. Preposterous as that view may be, it is legal to express it. It's troubling, then, because I find myself, if I am intellectually honest, forced to defend the rights of someone whose views I detest. But that is what comes with being a liberal in the tradition of John Stuart Mill. It will happen from time to time, and we must accept it. Leaving aside his actual views on prohibiting abortion, there is other dirt on Newman in that he made highly provocative statements in 2003 in protesting against the execution of convicted murderer Paul Jennings Hill. I'm a bit more sympathetic to keeping him out for those statements, which countenanced the murder of abortion providers. Still, nothing that is publicly known seems to suggest that Newman was going to promote violence on his visit to Australia. If there's something that has not been revealed - e.g. some evidence that he actually was intending to incite or promote violence - it needs to be explained properly to the public to put the matter at rest. Meanwhile, much of the reasoning being offered in the mainstream and social media for his exclusion is simply along the lines that he was planning to express extreme views about what the law should be in relation to abortion. Well, however much I hate those views, it is, once again, legal to express them in Australia, and it should be. Indeed, it is political speech: exactly the sort of speech that most merits protection, as the High Court has ruled in the past. The claim that such views should not be permitted public expression is nakedly authoritarian, and it's a disappointing, disturbing trend that so many people on the Left - traditionally the party of individual liberty and free speech - now seem to believe that we should be using the state's coercive power to suppress unwanted political views. Again, if the government has enough dirt on Newman and his plans to put an acceptable case for cancelling his visa and keeping him out, so be it. Let the public know the situation. But my liberal principles require me to insist that he not be prevented from coming here to speak merely, or even primarily, because he holds extreme political opinions on what should be the law relating to abortion. What has become shockingly clear to me - more than ever in the last few days - is how few people on the Left really support basic liberal principles. I'm appalled by this. I have to say, yet again: Freedom of speech is not just freedom for people to express ideas that we agree with or consider innocuous. If we're going to have a society in which freedom of speech is generally accepted, it will include freedom to express views that are nasty, ugly, and wrong.